Mensusa https://www.mensusa.com/articles/buy-the-best-matching-accessories-with-the-men's-yellow-blazer.html The White Tux Is Popular Grooming Attire Among Men MensUSA.com explores different attractive colors in tuxedos these include the white tux, blue tuxedo, and the silver tuxedo. Their brilliance has proved to work for men from all walks of life.Various colors available in tuxedo that match the white tux elegance. This groom is a typical match to bright colored or bright tuxedo vest and tie. The most popular combination for this groom is a white notched lapel two-button tuxedo, or matching a white tailcoat with fit white trousers. Other equally popular white tux jeans styles include Jean Yves made with a sophisticated flair mostly finished in the white illusion, Savoy Styles, and Mirage. The white tone gives that bright, decent, and stunning look in a white tux. The white tux is rarely seen compared to black tuxedos; hence, it gives you that different look when you are in it. White tuxedos are best appropriate when worn in hot weather and perfect outfits to groom you in the tropics. On the other hand, white tuxedos are the best dress codes to wear in Labor and Memorial Day in the regions outside the tropics. You must keep track of time and exercise caution to avoid embarrassments that people mistake for a waiter. Grab a blue tuxedo and feel the elegance it comes with. 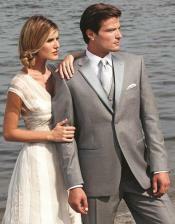 Tuxedos popularly known for the great and intriguing look these apart on men. A blue tuxedo, on the other hand, takes this elegant look at the next level, these superior sartorial guarantees you an impressive look that sets you apart. Mostly, these fine vintage pieces are exceptionally crafted with Italian finest Super 140's wool. Custom-made to fit several design constructs, the blue tuxedo assumes a semi-canvassed structure to enhance durability and conforms to any individual stature. We may customize it to suit your taste by matching it with a dual-vented coat and satin clipped streamlined pants. Since we are oriented to satisfying our customers, we always complement this tuxedo with a prominent detail like a dark satin lapel trim, satin buttons, a front ticket sized pocket, and aerated linings. The blue tuxedo's superficial and dark hue, imparts a perfect look whose elegance matches its boldness. You surely have to try it on. The silver tux features an entirely shiny luster; from the coat, vest, trousers, and corresponding long tie or bowtie its poly/viscose fabrics are furnished with bright silver lining and a visible sheen. Its coat features a frilled satin notch panel and a standard two-button front. The tux's boldness and inimitable style always proof eye-catching and gorgeous to anyone that lays their eyes on it. The lucky man who puts it on gets to enjoy a mixture of extreme comfort and confidence. It might seem a favorite to strict traditionalists, but this style perfectly grooms you as a bold man with incredible guts to stand out and prove himself. Following its boldness, flamboyant and unique style, the silver tuxedo has attracted a lot of attention and demand that every man regards it as a prom season's favorite. You are probably wondering where to get one! Reserve yours today at our fully stocked stores. You probably once walked into the street and saw a tuxedo suit that you could not take your eyes off it. With most grey tuxedo suits that is always the case. This tux features a single breasted front with two shiny buttons, a self-trimmed top collar satin notch, side vents, satin besom pockets, and crafted from a modern polyester or wool fabric material. Browse through mensusa.com today and reserve yourself a gray tuxedo that will certainly attract admiring gazes when worn in any formal event be it weddings, proms or official meetings. We owe our environment everything we have; we ought to show our loyalty and eco-friendliness from time to time. A green tuxedo outfit would be the most appropriate way to do just that. Our green tuxedos are made from deluxe quality fabrics and completed with tuxedo shirts, cummerbund or vest, and long or bow ties. They always impart a lucky look particularly during the famous St Patrick's Day event. Tuxedos are the best attires a man can have in his apparel. Despite their highly acclaimed popularity, you ought to check to make sure that you grab a decent tuxedo outfit that matches to your color and perfectly suits the formality of the events you attend. Most importantly, you should never let the fashion aspect in a tuxedo lead you towards compromising on quality.